From the very first page of “Blood Virus,” author L.A. Hollis captures the attention of her readers. Her book is based on a virus developed by a demented scientist who is obsessed by the Third Reich ideology, and with the help of other scientists, is killing off the West African population. 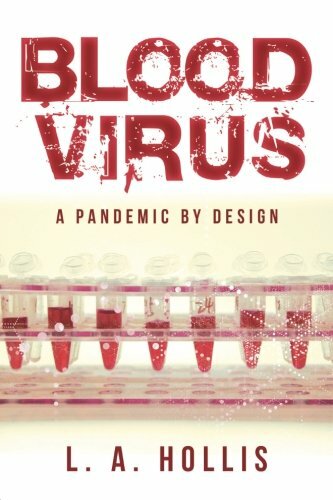 Blood Virus will keep readers fastened to the edge of their seat as they travel with Dr. Lennox Richards, an infectious disease physician working with the Center for Disease Control, to try to determine the cause and develop a treatment that will eradicate the virus. His wife Liz, a photographer for National Geographic insists that she accompany him so she can get “the big” story. Her main character, Dr. Lennox, is an African-American who adds to the intrigue of the story. What we find is that only African-Americans die from this, white individuals may contract the virus, but they somehow survive. For years bio-engineered viruses that target specific races have been discussed in conferences, behind closed doors, and at dinner tables across the world. Could this happen? Who would be so deranged to do something like this? Given her background in microbiology, along with exceptional research, Hollis has developed a story that will develop fear in even the staunchest person. She has developed many subplots that include racism, mixed marriages, voodoo, and Hitler-like thoughts. The book does have some scientific terminology and her narratives are sometimes in detail, and as such may boggle the mind of readers. Hollis meets her goal of having readers seriously consider this situation through her well-develop characters, wording and examples of the virus’ impact. Her graphic details of the impact on African-American victims are quite descriptive, and may be hard for some to read. Readers’ will learn some basic information on the process of identifying a virus, development of treatment, and the risks involved in this undertaking. I recommend “Blood Virus” by L.A. Hollis. Her writing flows, has twists, has underlying tones, and provides a great “What if?” story for readers.